What major benefits will we see as smart LED lighting begins to emerge as the key role player in smart cities and the IoT? There’s no doubt that smart LED lighting will play a major role in smart cities across the globe. But with the number of articles and ‘experts’ emerging, it’s becoming almost difficult to keep up. Time to take a step back and revisit what actual benefits smart lighting offers. Why is it imperative that cities start considering their plans for future growth? And what is lighting’s role to play? Here’s a list of the top three reasons why smart LED lighting is, and will continue to be a major catalyst for the evolution into the IoT, and the rapid development of smart cities worldwide. There’s an argument that we’re already connected. There’s social media, smartphones, blogging platforms… the entire internet is a hub for ‘connectivity’, so do we really need more? Think about driving to work every day. How many street lights do you see between your driveway and your office? Heaps, right? Imagine if each individual light fixture had technology onboard which allowed it to connect to a single cloud solution. This scenario can provide real-time data to central servers that give updates on things like traffic density, temperature, and brightness. And better yet, all this data can be sent and controlled via a single app. Civic authorities can utilise this information to reduce energy consumption in less dense zones, adjust light temperature and brightness to increase safety and comfort on our roads and pathways… the possibilities are endless! Lighting fixtures are one of the most obvious hosts for connectivity due to their centralised location and abundance throughout major cities across the globe. Companies in the lighting industry need to prove their commitment to the future and come up with technology-based solutions. They need to stay relevant and innovative to meet the adapting needs of the industry and the global population. If you haven’t heard that we’re slowly killing the planet by now, then you’ve probably been under a rock for the better part of the last decade. According to Charles Nobles, up to 40% of a city’s energy load is attributed to streetlights. Combined with a rapidly increasing global population, and it’s clearly a necessity that city planners and civil authorities look for new, innovative ways to reduce their carbon footprint. It’s a known fact that the energy required to power more traditional lighting sources is much higher than LED. In fact, it’s estimated that switching to smart LED lighting could save 40% of total lighting energy. Think of the massive affect this would have on our environment (not to mention city budgets). An additional report released by The Climate Group showed that adopting LED street lighting alone achieved energy savings of between 50-70%, and this figure was increased when combined with smart LED controls systems. The popularity of LED lighting has continued to increase since its introduction into the market. But SMART LED lighting is one step further. When a city looks to make the transformation into a smart city, they must look for solutions to their connectivity problems. This means we’ll see a higher uptake of smart LED lighting, and ultimately less greenhouse gases being emitted into the atmosphere. The environment needs to be a massive consideration in all new urban developments and redevelopments, and lighting fixtures that are interconnected undoubtedly offer the most opportunity to lower energy consumption. We might not always say it, but almost all business decisions come down to one single factor… economic growth. But how does adopting a smart lighting solution help improve a city’s bottom-line? There’s two factors: reduced energy consumption and subsequent cost savings (which has already been mentioned); and tourism. High-quality, intelligent LED lighting enhances the attractiveness of any building, structure, bridge… whatever! Compare the quality of light to traditional light sources and I doubt there’s many people that would pick the non-LED light. Effective light design makes projects more aesthetically pleasing, and transforms them into landmarks of cities. Despite the initial investment of sophisticated lighting systems, cities consistently see the benefits through the influx of tourists, and the boost in economic growth in the region. Imagine some of the major tourism attractions that exist today. Take the Sydney Opera House in Australia. It’s the most visited tourist-attraction in the entire country, and a report released by Deloitte estimated its cultural and iconic value to be $4.6 billion. Below is a picture of its main Concert Hall. What accentuates its architecture and brings life to the heritage feature? Light, of course. Only LED lighting offers the advanced control and colour-changing capabilities needed to bring these structures to life. People love spectacular lighting shows. In fact, there’s festivals and events around the world solely based on the celebration of light. Take the recent Vivid Sydney – an astonishing city-wide festival. The initial investment required to implement smart LED fixtures is heavily outweighed by the long-term financial savings for city budgets. 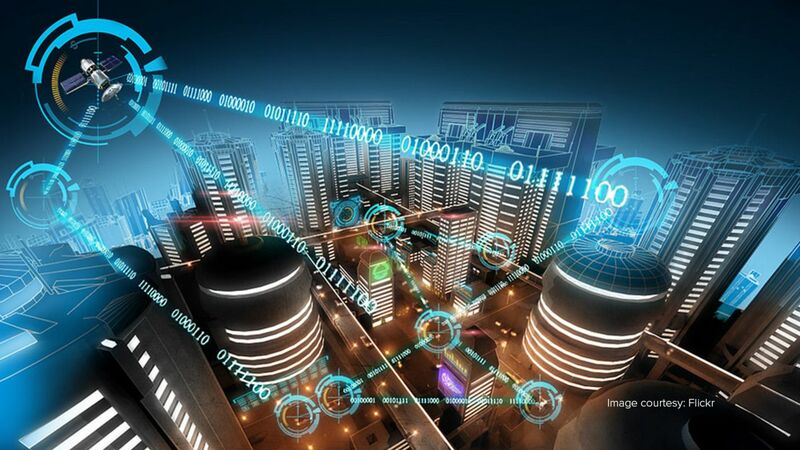 City planners must start to think to the future of whether smart LED lighting will play a vital role in their development into the IoT and the growth of their cities as a whole. What other benefits do you think we’ll see through smart lighting’s role in the development of smart cities and the IoT? Get in touch through the comments or give me a buzz on social media through the links below. Stay informed about the latest advancements in smart lighting and lighting technology by signing up to Lumascape’s newsletter at the bottom of this page.